Background: Orofacial clefts are among the most common anomalies in the head and neck region and both genetic and environmental etiologies can be implicated. Aims: To evaluate the association of certain environmental risk factors with non-syndromic orofacial clefts (NSOFCs) and to determine the most common type of clefts associated with these factors. Methodology: 288 participants were included in this cross-sectional study; 144 in case group (mothers of children with NSOFC) and equal number of control group (mothers of healthy children). Details about gender of child, type of cleft, maternal gestational age and health, level of education, socioeconomic status, folic acid intake, consanguineous marriage, family history of clefts, radiation exposure, chemotherapy, gestational smoking, alcohol and drug intake were recorded. Results: Low education level (p. v=0.001), lack of folic acid supplementation (p. v=0.003, OR=0.20, 95% CI: -0.6_1.0) family history of clefts (p. v=0.014, OR=6, 95% CI: 4.68_7.26) and low socioeconomic status (p. v=0.042) were significantly associated with NSOFCs. Using multivariate analysis, maternal education was the most significant factor followed by folic acid supplementation. Conclusion: low education level, lack of gestational folic acid intake, family history of clefts, low socioeconomic status and consanguineous marriage all should be considered as potential risk factors for NSOFCs. Among these, maternal education and gestational folic acid supplementation were the most significant ones. Isolated cleft lip was the commonest type associated with these factors. 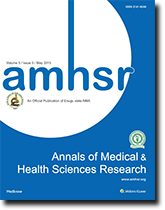 This study aims to make an overview on the environmental risk factors (History of drugs intake during pregnancy, periconceptional folate intake, alcohol consumption, smoking habits, vitamin deficiency, diabetes, exposure to toxins, maternal age as well as socioeconomic status of the mother) in patients with non-syndromic cleft in Sudan. A descriptive, case-control hospital-based study was conducted in Khartoum, Capital of Sudan. Cases were mothers aged (15-47) who had children with NSOFCs and attended Khartoum Teaching Dental Hospital, Soba Teaching Hospital, Ribat Teaching Dental Hospital, and Omdurman Military Hospital, while the controls were a random sample of mothers who had normal children with no defects who attended the same hospitals for different reasons during 2015-2016. Mothers of both case and control groups were interviewed in these hospitals by the same principle investigator. The same data collection sheet was used for both case and control groups, except for the question of the type of cleft that was only asked for cases. The structured questionnaire involved the most possible environmental risk factors that contributed to NSOFCs, including, maternal age, folic acid intake, education and socio-economic status, consanguineous marriage, medical history, illnesses during pregnancy, exposure to (radiation or radio/chemotherapy), smoking and alcohol consumption and drugs history. The interview included detailed questions regarding personal data including educational level, socioeconomic status and consanguineous marriage. Also, information about gestational period including, if there was regular follow up with obstetrician doctor during gestation period, familial history of clefts, maternal age, history of illnesses and exposure to radiation or radio/chemotherapy. About medical history, mothers were asked for diabetes and epilepsy. Social history included asking about smoking and alcohol consumption. Regarding drug history, mothers were asked about current medication, or any drug was used during pregnancy that might involve antifolates or antiepileptic drugs or even steroids. Lastly, folic acid and others vitamins intake during gestational period and the period of intake whether mother recalled that. Approval letter from the Ethical Committee of University of Khartoum was obtained prior to the conduction of this study and permission from the respective authorities was obtained before starting interviewing participants. The aim of the study was explained to mothers and a verbal consent was obtained. IBM SPSS version 20.0 was used for entering and analyzing the data. Descriptive statistics were obtained including frequency distribution tables and graph. Chi square test was used to find association between environmental risk factors and OFCs in which p-value of <0.05 considered significant. Finally, logistic regression for multivariate analysis was also used. The study included 144 cases of non-syndromic clefts and 144 healthy controls with no birth defects. Thirty-five males and forty-five females were in the CL group, while thirty-seven males and twenty-one females were in the CLP group. The CP group consisted of four males and only two females. The most common type of OFCs in this study was the cleft lip (55.6%), while only (4.2%) of patients had cleft palate [Figure 1]. There was no significant difference between cases and controls with respect to maternal age [Table 1], history of illnesses during pregnancy, exposure to radiation, radiotherapy or chemotherapy, and history of diabetes (p-value was > 0.05 for all these variables. Figure 1: Type of cleft among case group. No one of the participants in the case and control groups had epilepsy or mentioned a history of using of antiepileptic and steroids (antifolate drugs) during pregnancy. In addition to that, no association was found between smoking and alcohol consumption and risk of NSOFCs since no one of interviewees reported history of smoking or alcohol intake during their pregnancy. There was a statistically significant difference between the two groups with respect to gestational folic acid intake. (p-value=0.000) [Figure 2]. Chi-square test showed a significant difference between the two groups (p-value=0.000) in regards to the level of education of interviewed mothers [Table 2]. low socioeconomic status was more among cases (25.7%) than those in controls (16.7%), chi-square test showed statistically significant difference (p-value< 0.05) [Figure 3 and Figure 4]. Mothers in the case group had a higher percentage of marriage to their relatives (71.5%) than those in the control group (47.9%) [Figure 5]. The difference between the two groups showed to be statistically significant (p-value=0.003). Positive history of clefts in families was significantly associated with risk of OFCs in children (using chi-square test p-value=0.003) [Figure 6]. Table 3: Maternal age group and the type of cleft. Table 4: Folic acid intake and the type of cleft. 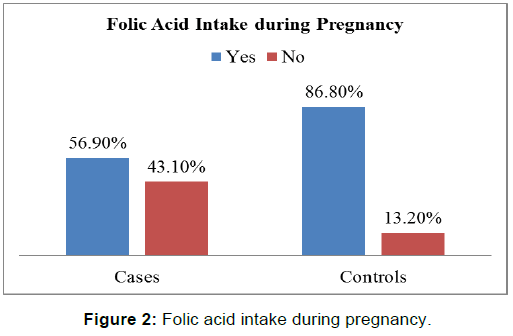 Figure 2: Folic acid intake during pregnancy. 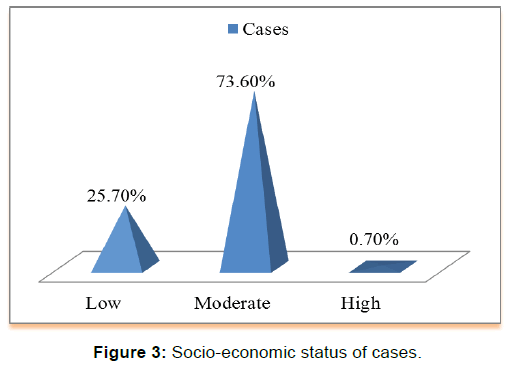 Figure 3: Socio-economic status of cases. 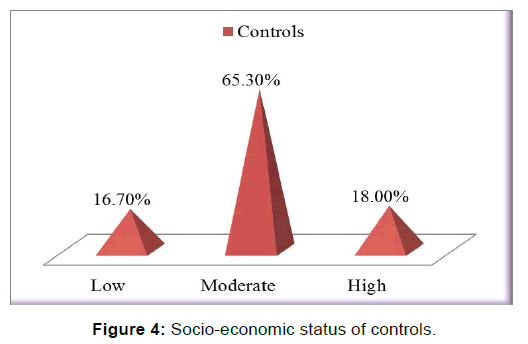 Figure 4:Socio-economic status of controls. Figure 6:Familial history of cleft. In regards to distribution of OFCs Risk Factors among each Type of Cleft we found that CL was the commonest type in almost age groups except the age group of (11-20 years), in which CLP was more common [Table 3]. 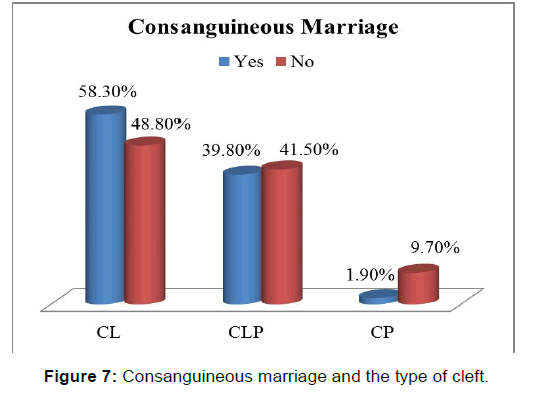 CL was also the commonest type of cleft associated with all risk factors i.e., Folic acid intake, positive familial history of clefts and consanguineous marriage [Figure 7]. In addition, it was the commonest type in all level of mothers’ education and all categories of socioeconomic status as well [Tables 4-8]. Table 5: Education level and type of cleft. Table 6: Socio-economic status and the type of cleft. 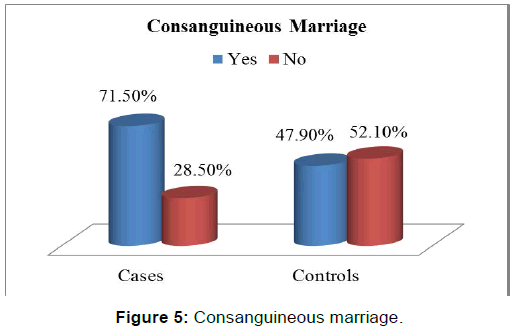 Figure 7:Consanguineous marriage and the type of cleft. Table 7: History of clefts in families and the type of cleft. Table 8: History of maternal illnesses during pregnancy and the type of cleft. Four mothers previously exposed to radiation gave birth with cleft lip and palate, while six diabetic mothers had their babies born with cleft lip. Multivariate analysis was performed to determine the most significant risk factor of OFCs. Binary logistic regression was performed and it showed that the education level was the risk factor with the strongest association (p-value=0.001), followed by folic acid intake (p-value=0.003), then familiar history of clefts (p-value=0.014) and lastly the socioeconomic status (p-value=0.042). Orofacial clefts are among the most common anomalies in the head and neck region and both genetic and environmental etiologies can be implicated. This study investigated the association of several certain environmental risk factors with risk of non-syndromic orofacial clefts. With respect to maternal age, the common age group of interviewed mothers was 21-30 years for both cases and controls groups, this finding is contrary to that of Monlleó  and Shapira’s study,  among Brazilian and Israeli Jews and Arabs population respectively. Monlleó found that almost one third of mothers in his study were either < 18 or > 35 years. Low maternal age increase risks of labor problems, prematurity, low birth weight, and hypoxia, mainly due to reproductive system immaturity, poor maternal nutrition, and frequent use of legal and illegal drugs,  whereas in Shapira’s study, new born of young mothers (<20 years) and old mothers (>45 years) had significant higher cleft rates (p-value< 0.009). Several studies have evaluated the impact of education level on the risk of non-syndromic orofacial clefts. Low maternal education, which may contribute to the lack of awareness of the importance of healthy diet and nutrition including folic acid vitamin supplementation in the early stage of pregnancy seemed to be a risk factor for having a child with non-syndromic orofacial clefts as in Taghavi’s study. The most obvious finding to merge from the data analysis in this study is that the majority of mothers in the case group had primary and secondary educational levels, whereas the majority of those in the control group are highly educated (p-value=< 0.05), although these results reflect those of Krapels’s study, in which also found that the low education level was associated with increased risk of CLP,  it seems that they may be due to sampling bias (selecting of mothers in these hospitals). It was hypothesized that the low socioeconomic status is a risk factor for orofacial clefts that have to be considered, because it can be a marker of parental health and life style, the life style factors, either alone or in combination with occupational activities and genetic background, play a role in the etiology of orofacial clefts. One of the finding in this study that (25.7%) of cases associated with low socioeconomic status in comparison to (16.7%) of controls, with significant p-value< 0.05. These results agree with Clark’s findings, in which reported the prevalence of orofacial clefts was increased with increasing deprivation,  however this does not appear to be the case in Carmichael’s study, that reported no association between maternal socioeconomic status and orofacial clefts. Surprisingly, the current study accords with previous reports which demonstrated that the association between the socioeconomic status and the risk of orofacial clefts was only observed in cases with cleft lip/ and or palate but not for isolated cleft palate. . The current study was designed to evaluate the history of the clefts in the families of interviewed mothers and its association with risk of orofacial clefts, the results indicate significant association (p-value=0.003 and OR =5.97, CI: 4.68 _ 7.26), comparison of these findings with those of other studies confirms this association as in Leite’s study, which demonstrated that the history of oral clefts either in the father‘s (OR =5.0) was strongly associated with both types of orofacial clefts (CL/P). This association between the history of clefts in relatives’ families and the risk of orofacial clefts may be attributed to the role of genetic factors. The present study found that there was no significant association between maternal history of diabetes and occurrence of orofacial clefts, (p-value=0.649), odd ratio =1.52, (95% CI: -0.3 _ 3.34), however this in contrast to Moore‘s study, in which pregnancies of women who were both obese and diabetic were 3.1 times as likely (95% CI: 1.2 _ 7.6) to result in an offspring with craniofacial defects including orofacial clefts than were those of non-obese, non-diabetic women, which suggests that obesity and diabetes mellitus may act synergistically in the pathogenesis of congenital anomalies. A previous study conducted by Abrishamchian, demonstrated that maternal epilepsy was associated with increased risk of non-syndromic orofacial clefts. However, the present study did not detect any evidence of this association. This result may be explained by the fact that no epileptic mothers were present in both cases and controls groups. Several studies had demonstrated that the maternal fever and the common cold during the first trimester as risk factor for orofacial clefts. [14,22,23] Mothers with history of influenza, common cold, orofacial herpes, and gastroenteritis during pregnancy were associated with increased risk to born children with isolated cleft lip +_ cleft palate. Cold is a common source of fever, which has been associated with increased risk of birth defects in both animals and humans, particularly for neural tube defects. High temperature may result in the arrest of mitotic activity and cell death in mitosis phase. In contrast to earlier findings, in which no association was found to occur between maternal history of fever or any other illnesses during pregnancy and risk of orofacial clefts (p-value=1 OR =1.95%, CI: 0.24 _ 1.76). In conclusion, the present study demonstrates a significant association between certain environmental factors with the risk of NSOFCs. Folic acid intake during pregnancy, maternal education level, familial history of OFCs, socioeconomic status, and consanguineous marriage all are shown to be significantly associated with risk of OFCs. The education level of mothers was found to be the most relevant environmental risk factor followed by folic acid intake during pregnancy (by using logistic regression). Moreover, no statistically significant association was observed between the maternal history of diabetes, illnesses and radiation exposure during pregnancy with the risk of non-syndromic orofacial clefts. The current study shows no correlation between maternal smoking, alcohol consumption, history of epilepsy and the use of antifolate drugs during pregnancy in the occurrence of OFCs. However, lack of this correlation could be a statistical bias since no mother in the present study was a smoker, alcoholic, epileptic or used antifolates drugs during pregnancy. • Some association between risk factors and OFCs may be a possible result of chance. • Although adjustment of several potential confounders in this study was done, the possibility of unmeasured confounding factors could not be ruled out. • Recall bias can be one of the draw backs of this type of study; mothers in case group may recall past events and exposures differently than those in control group. • The study did not include some factors related to OFCs such as maternal dietary habits during pregnancy, occupational exposures and life style factors; in addition to the gene-environmental interaction. • Data regarding timing and duration of supplementation was not available. Del Prete S, D'urso A, Tolevski Meshkova D, Coppotelli E. Cleft lip and palate: A review of the literature. Webmed Central Orthodontics 2014;5:WMC004783. Suleiman A, Hamzah S, Abusalab M, Samaan KT. 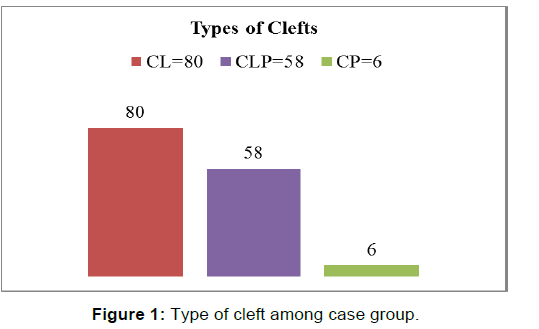 Prevalence of cleft lip and palate in a hospital-based population in the Sudan. Int J Paediatr Dent. 2005;15:185-189. Agbenorku P. Orofacial clefts: A worldwide review of the problem. Int Sch Res Notices. Plastic Surgery. 2013;13:2-7. Stanier P, Moore GE. Genetics of cleft lip and palate: syndromic genes contribute to the incidence of non-syndromic clefts. Hum Mol Genet. 2004;13: R73-R81. Monlleó IL, De Barros AG, Fontes MI, De Andrade AK, Brito GD, Do Nascimento DL, et al. Diagnostic implications of associated defects in patients with typical orofacial clefts. J Pediatr. 2015;91:485-492. Shapira Y, Haklai Z, Blum I, Shpack N, Amitai Y. Prevalence of non-syndromic orofacial clefts among Jews and Arabs, by type, site, gender and geography: A multi-center study in Israel. Isr Med Assoc J. 2014;16:759-763. Itikala PR, Watkins ML, Mulinare J, Moore CA, Liu Y. Maternal multivitamin use and orofacial clefts in offspring. Teratology. 2001;63:79-86. Tolarova M, Harris J. Reduced recurrence of orofacial clefts after periconceptional supplementation with high-dose folic acid and multivitamins. Teratology. 1995;51:71-78. Shaw GM, Wasserman C, O'Malley C, Tolarova MM, Lammer EJ. Risks of orofacial clefts in children born to women using multivitamins containing folic acid periconceptionally. Lancet. 1995;346:393-396. Carinci F, Rullo R, Farina A, Morano D, Festa VM, Mazzarella N, et al. Non-syndromic orofacial clefts in Southern Italy: pattern analysis according to gender, history of maternal smoking, folic acid intake and familial diabetes. J Craniomaxillofac Surg. 2005;33:91-94. Hayes C, Werter MM, Willett WC, Mitchell AA. Case-control study of periconceptional folic acid supplementation and oral clefts. Am J Epidemiol. 1996;143:1229-1234. Krapels IP, Zielhuis GA, Vroom F, De Jong-Van den Berg LT, Kuijpers-Jagtman AM, Van der Molen AB, et al. Periconceptional health and lifestyle factors of both parents affect the risk of live-born children with orofacial clefts. Birth Defects Res A: Clin Mol Teratol. 2006;76:613-620. Clark J, Mossey P, Sharp L, Little J. Socio-economic status and orofacial clefts in Scotland, 1989 to 1998. Cleft Palate Craniofac J. 2003;40:481-485. Carmichael SL, Nelson V, Shaw GM, Wasserman CR, Croen LA. Socio-economic status and risk of conotruncal heart defects and orofacial clefts. Paediatr Perinat Epidemiol. 2003;17:264-271. Jamilian A, Nayeri F, Babayan A. Incidence of cleft lip and palate in Tehran. J Indian Soc Pedod Prev Dent. 2007;25:174-176. Leite ICG, Koifman S. Oral clefts, consanguinity, parental tobacco and alcohol use: a case-control study in Rio de Janeiro, Brazil. Braz Oral Res. 2009;23:31-37. Moore LL, Singer MR, Bradlee ML, Rothman KJ, Milunsky A. A prospective study of the risk of congenital defects associated with maternal obesity and diabetes mellitus. Epidemiology. 2000;11:689-694. Abrishamchian AR, Khoury MJ, Calle EE. The contribution of maternal epilepsy and its treatment to the etiology of oral clefts: A population based case-control study. Genet Eepidemiol. 1994;11:343-351. Xu LF, Zhou XL, Wang Q, Zhou JL, Liu YP, Qiang JU, et al. A Case-control Study of Environmental Risk Factors for Nonsyndromic Cleft of the Lip and/or Palate in Xuzhou, China. Biomed Environ Sci. 2015;28:535-538. Métneki J, Puhó E, Czeizel AE. Maternal diseases and isolated orofacial clefts in Hungary. Birth Defects Res A: Clin Mol Teratol. 2005;73:617-623. Hao Y, Tian S, Jiao X, Mi N, Zhang B, Song T, et al. Association of parental environmental exposures and supplementation intake with risk of nonsyndromic orofacial clefts: A case-control study in Heilongjiang Province, China. Nutrients. 2015;7:7172-7184. Zandi M, Heidari A. 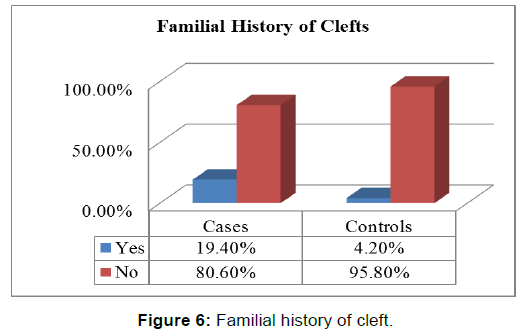 An epidemiologic study of orofacial clefts in Hamedan City, Iran: a 15-year study. Cleft Palate Craniofac J. 2011;48:483-489. Beaty TH, Maestri NE, Hetmanski JB, Wyszynski DF, Vanderkolk CA, Simpson JC, et al. Testing for interaction between maternal smoking and TGFA genotype among oral cleft cases born in Maryland 1992-1996. Cleft Palate Craniofac J. 1997;34:447-454. Honein MA, Rasmussen SA, Reefhuis J, Romitti PA, Lammer EJ, Sun L, et al. Maternal smoking and environmental tobacco smoke exposure and the risk of orofacial clefts. Epidemiology. 2007;18:226-233. Sabbagh HJ, Hassan MH, Innes NP, El-Kodary HM, Little J, Mossey PA. Passive smoking in the etiology of non-syndromic orofacial clefts: A systematic review and meta-analysis. PLoS One. 2015;10:e0116963. Shaw GM, Wasserman CR, Lammer EJ, O'Malley CD, Murray JC, Basart AM, et al. Orofacial clefts, parental cigarette smoking, and transforming growth factor-alpha gene variants. Am J Hum Genet. 1996;58:551-561. Shaw GM, Lammer EJ. Maternal periconceptional alcohol consumption and risk for orofacial clefts. J Pediatr. 1999;134:298-303. Hernández-Díaz S, Werler MM, Walker AM, Mitchell AA. Folic acid antagonists during pregnancy and the risk of birth defects. N Engl J Med. 2000;343:1608-1614.